The CCM ETF Stack Rank Model shows the strongest trends on multiple timeframes (1-month to 1-year) are dominated by defensive ETFs and ETFs that benefit from lower/stable interest rates and a weaker U.S. dollar (e.g. income and foreign/emerging markets). From a bigger-picture perspective, has the impressive V-rally in stocks flipped the trends back to a “the economy looks solid” footing? 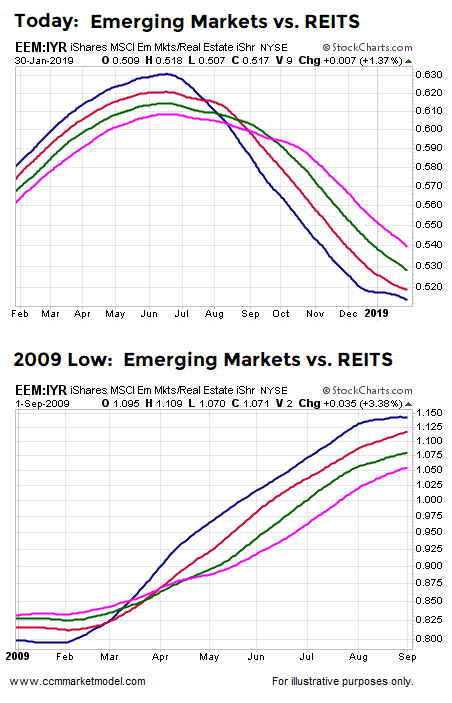 The chart below shows the intermediate/long-term trend in emerging markets relative to more defensive/income-oriented REITS (EEM vs. IYR). Notice how the present day chart has not flipped in favor of emerging markets as it did near the March 2009 low in the stock market. The generic moving averages (125, 150, 175, 200-day) are shown to illustrate basic concepts about trends and investor risk tolerance. A similar “growth-oriented ETFs have not turned yet vs. defensive ETFs” can be seen using the same two periods, but this time via the technology-to-defensive-utilities ratio (XLK vs. XLU). The intermediate-to-long-term trends may flip soon in 2019, but they have not flipped as of Wednesday, January 30, 2019. The same concepts can be seen by comparing and contrasting the two growth stocks vs. bonds (VUG vs. IEF) charts below. Our purpose here is not to make the bearish case, but rather to illustrate what we are still seeing in the hard data. 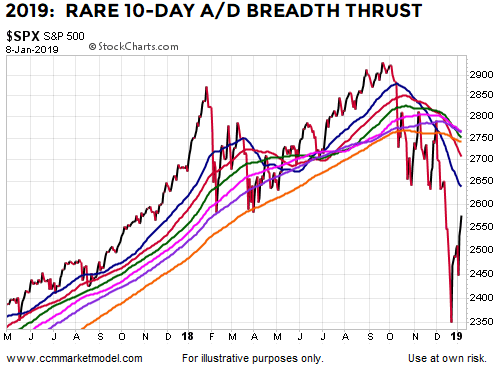 Our S&P 500 trend strength model has shown some very modest improvement this week and the ETF Stack Rank is not yet screaming “everything looks great”. We will continue to take it day by day, monitoring the data with an open mind. The S&P 500 went straight down after the December Fed meeting and now has moved straight up off the recent low. 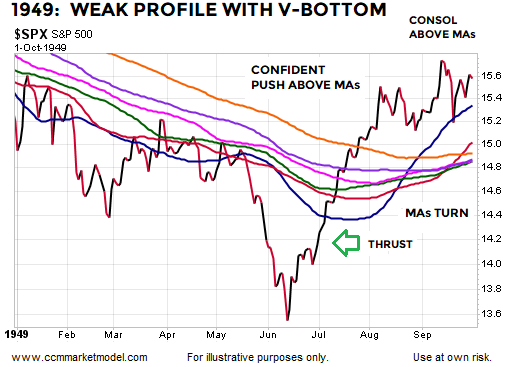 The recent push higher is now testing one of the downward-sloping trendlines covered in last week’s video (see clip). A larger version of the chart below can be found in the CCM Twitter Feed. What Are The Odds Of A V-Bottom In Stocks? WHAT CAN WE LEARN FROM 21 SIMILAR HISTORICAL CASES? Are Stocks Out Of The Woods?